Scouting was contributing to the education of young people, through a value system based on the Scout Promise and Law to help build a better world where people are self-fulfilled as individuals and play a constructive role in society. 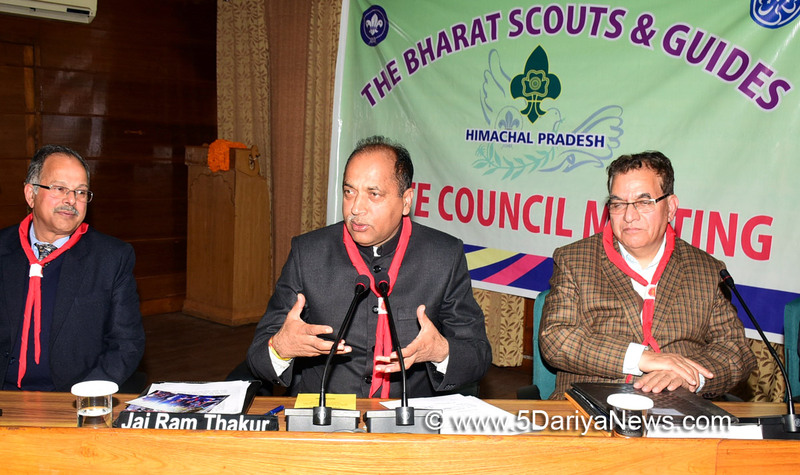 Chief Minister Jai Ram Thakur stated this while presiding over the State Council Meet of The Bharat Scouts and Guides held here today.The Chief Minister called upon the students and teachers to participate regularly in the activities of scouts and guides movement. “Now-a-days, a lot of youngsters are facing problems due to lack of self-confidence thus joining the scout movement will create a sense of self-confidence and courage,” he said. “It fosters personality development of the students and help them imbibe a sense of social responsibility. They become disciplined and courageous, and are in forefront during critical times,” he added.Jai Ram Thakur said that it was vital that apart from excelling in the field of education, the students must become a good citizen of the country. He said that Associations like Scouts and Guides play a major role in this direction. He appreciated the role of students of the Bharat Scouts and Guides in helping the affected during the flash floods in Kullu District. While expressing concern over the increasing incidences of drug abuse amongst the students, Chief Minister urged the Scouts and Guides to play a pro active role in curbing this menace. He said that the grant in aid of Rs 25 lakh due for the Bharat Scouts and Guides would be released soon. He assured that the same would be enhanced appropriately.The Chief Minister said that 1897 schools, 67 colleges and 7 open units were registered with the Association. He said that the State has a total number of 48,230 scouts and guides in the State. He said this was an voluntary and educational movement, for people of all ages.The Chief Minister was formally nominated as the President, whereas Education Minister as Vice President of the State Council of Bharat Scouts and Guides Himachal Pradesh.The Chief Minister also honoured Jyoti Charan Chauhan on the occasion for receiving Asia Pacific Messengers of Peace Hero Award during the 26th Asia Pacific Scout Conference held recently at Manila Philippines.Education Minister Suresh Bhardwaj said that the Scouts and Guides help its members to grow mentally and physically strong so that they can make a positive contribution for their communities and the world. He stressed the need for devotion, duty, and discipline among the members. Today this Association was working in 120 countries of the world, he added. He said that Scouts and Guides played a commendable role in helping the people at the time of natural calamity in the State.Director Higher Education Dr. Amarjit Sharma welcomed the Chief Minister and other dignitaries on the occasion. He explained the role played by scouts movement in moulding the character and individuality of a person and spoke about the services rendered to the society by the scouts and guides movement.Secretary Education Dr. Arun Kumar Sharma, Director Elementary Education Rohit Jamwal, Former Director Education Dr. Dinkar Burathoki, Registrar Himachal Pradesh University J.S. Negi were present on the occasion among others.